I’m on a roll now! Two more squares today! I now have three! My hands hurt a bit now though. Does this get better in time? they look great! i wish i could wrap my head around it the way you have – you clever duck! I watched tutorials – then read tutorials, then realised my main problem was not pushing my stitches across so they sat nice. Once I realised that I was off! Oh good for you!!!! 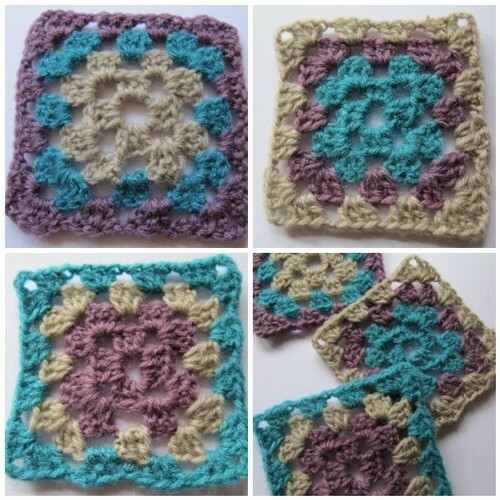 These are EXACTLY what my first granny squares looked like – about a year and a half ago. Your hand does get used to holding the hook, so fear not. And the more you crochet, the more your tension improves, you don’t even really have to actively work on it, just keep crocheting! I am so pleased you kept trying! Look at you now! Hurrah!! Thanks Pip! If it weren’t for your tutorials I think I would have given up!